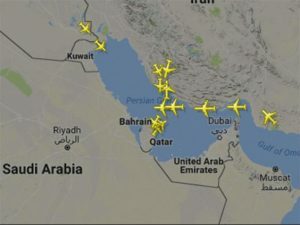 The UAE General Civil Aviation Authority (GCAA) Wednesday said Qatar-registered aircrafts can only use international airspace ‘managed’ by United Arab Emirates (UAE), as opposed to comments by Montreal-based International Civil Aviation Organization (ICAO) that “some existing air route availability has been assured, and some new temporary or contingency routes have also been developed,” including through Bahrain and UAE airspace. The GCAA said Qatar-registered aircrafts are still banned from UAE’s own airspace, reports say. ICAO’s spokesman had told the media on Tuesday that the UN agency has been working with “various Middle Eastern states to ensure equitable access to airspace for Qatar-registered aircraft” following the sanctions announced on June 5. Saudi Arabia, UAE, Bahrain, plus Egypt severed ties with Qatar and cut off air, sea and ground links with Doha. The four allies also banned all Qatar-registered aircrafts, including the country’s national carrier Qatar Airways, from flying over their airspaces. The ban significantly deteriorated the carrier’s operations as it was forced to use longer and more expensive routes. Travelers have also suffered from the decision. Qatar Airways had welcomed the ICAO decision, made after Doha called the agency to intervene in the haggle between the tiny Emirate and its neighbors. The airline’s chief executive Akbar al-Baker reportedly said that his company was looking at “the flexibility and benefit” of one “very short route”. Posted by KanelkaTagba on Aug 10 2017. Filed under Gulf News, Headlines. You can follow any responses to this entry through the RSS 2.0. Both comments and pings are currently closed.